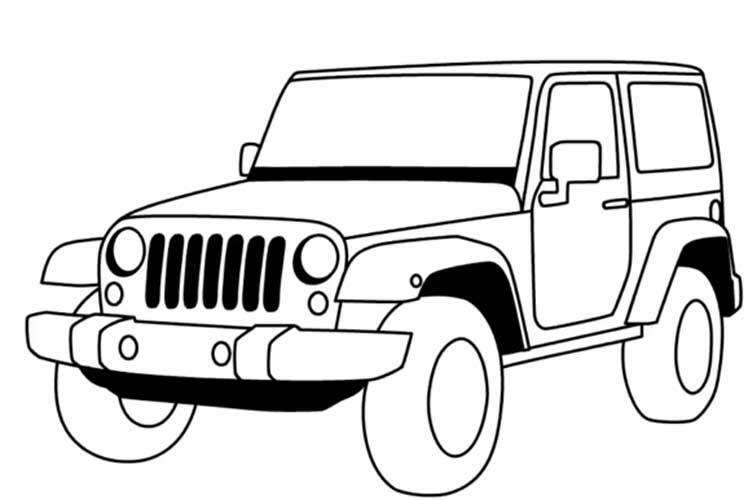 How to draw a jeep easily and simply in 4 options? 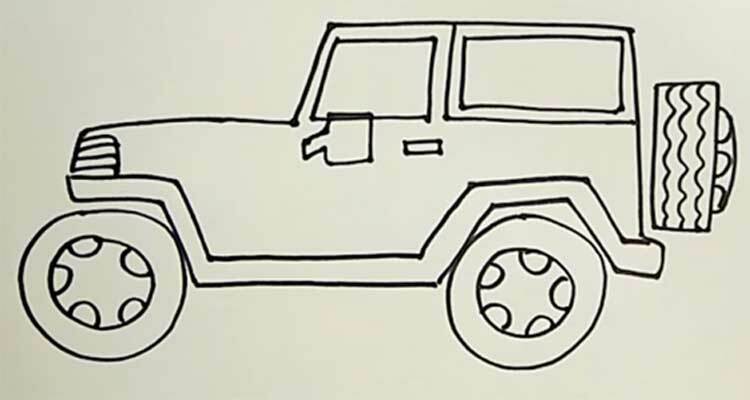 In this article, we will look at how to draw a jeep! This is a passable car that can drive through any dirt and swamps. 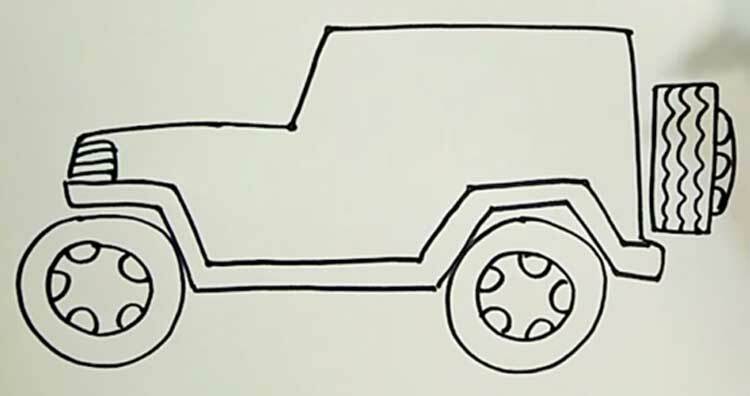 Today we will tell how to draw a jeep. 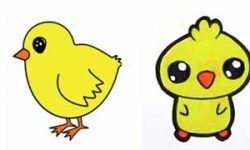 The article presents a variety of drawing methods, complex and more straightforward. You can choose for yourself those that will please you the most. 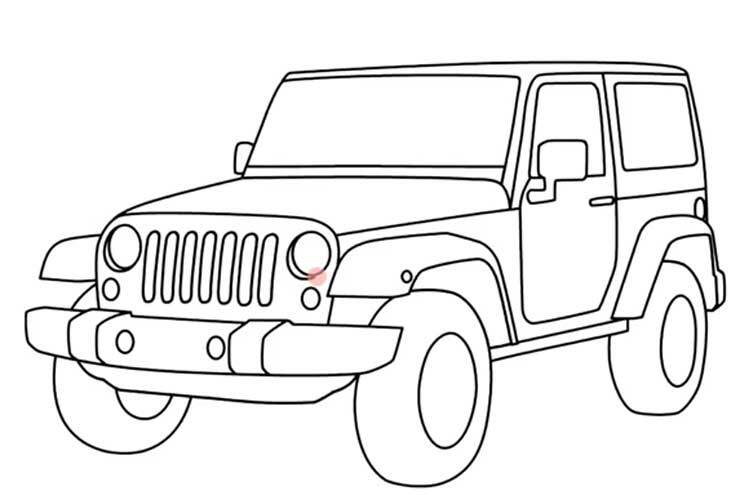 In this section, we will look at how to draw a jeep with a side view in stages. The drawing will be flat, so it will be much easier to draw it on paper than the two previous examples. Draw a body in general terms, and then we will detail it by adding small details. So, we represent the upper part and the lower part of the arches and the wing. At this stage, we need to add a headlamp. 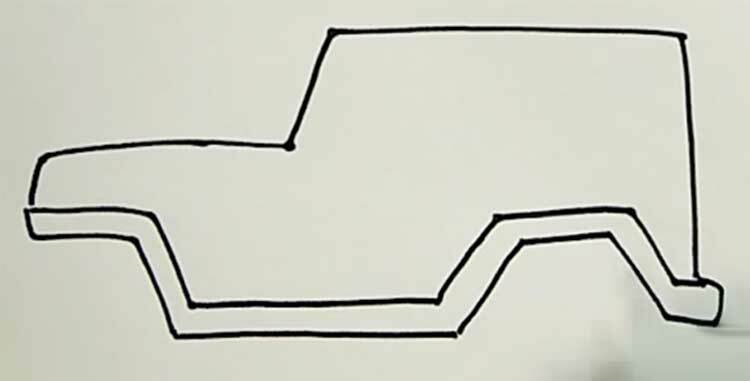 Also, we will depict in the wheel arches. 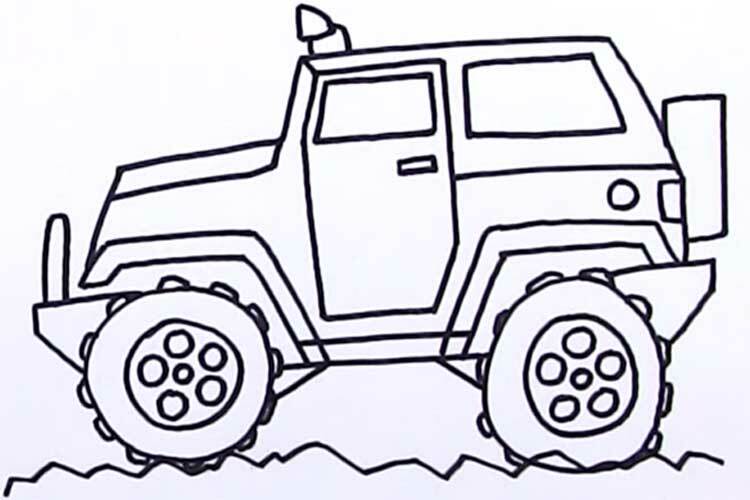 Jeeps very often drive off-road and damage the tires; it is for such cases that the spare wheel hangs on the trunk, we also need to draw it. Add small items, namely two windows, a door handle and a side mirror. If you think that the picture is too simple, you can add something else. For example, turn signals or driver behind the glass. To colour the resulting picture, we chose red as the primary colour. Most of them were painted over for them; the secondary colour is black, some elements were painted over with them. But for the rear window and headlights, we chose brown and yellow. 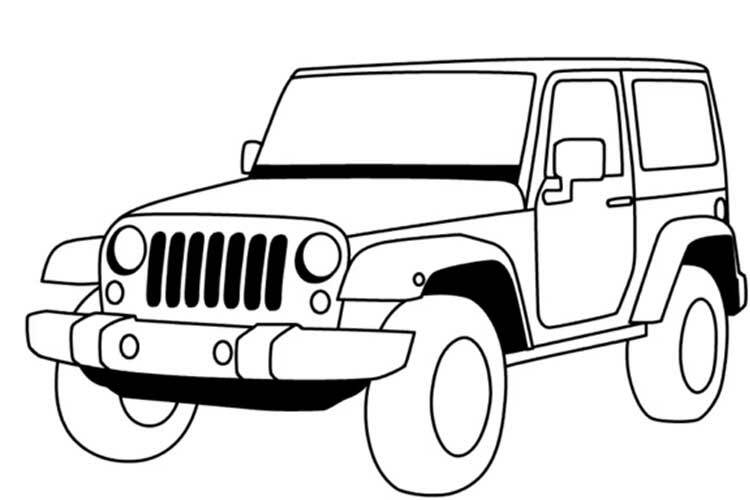 The final example of this article will show how to draw a jeep child. Just like in the previous paragraph, the drawing will side view. 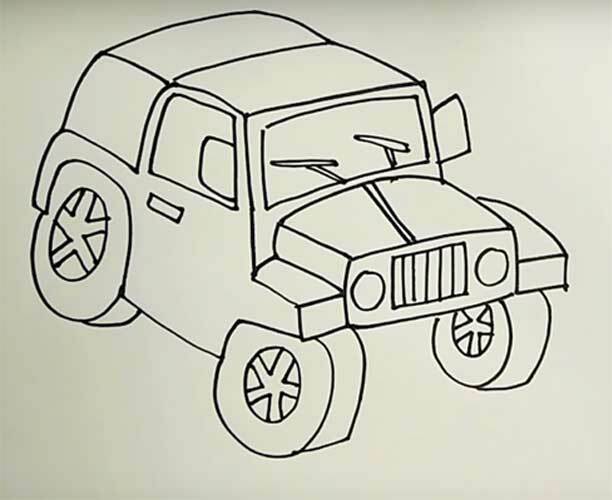 Because of this, portraying a car on paper is many times simpler, so an example is suitable for children of any age. Work on the bottom. 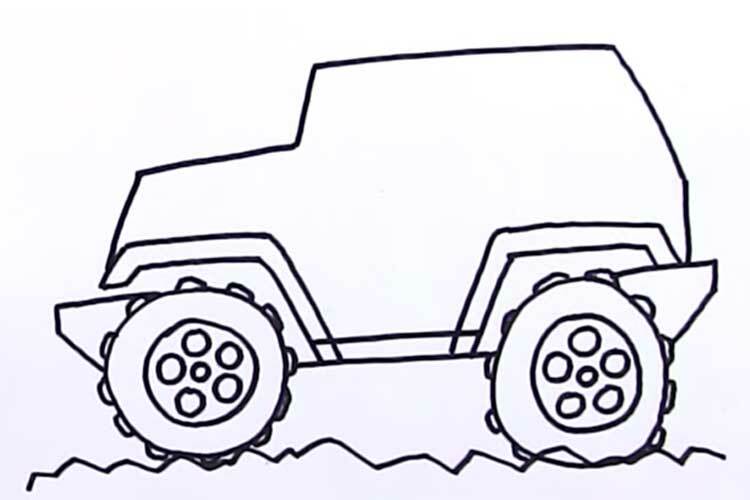 First, we will depict the uneven ground on which the machine will move. 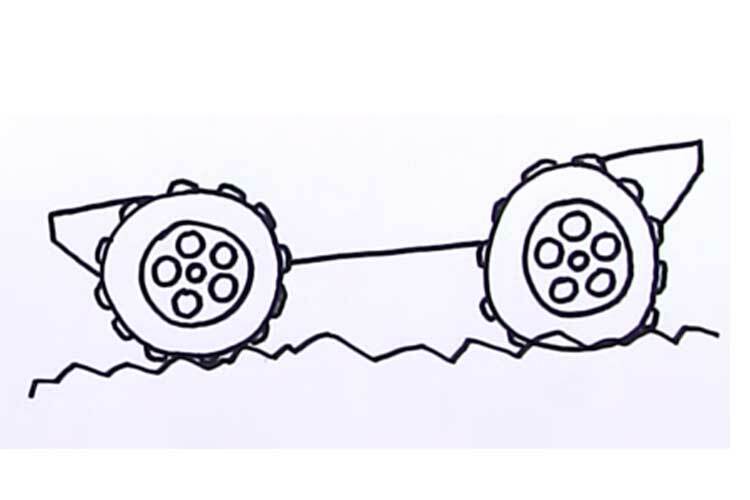 Then we add huge studded wheels and connect them in a straight line. On the edges of the draw bumpers. By what we have already depicted, we need to draw the central part of the body. This is done quite simply. Take a look at the picture below, and you will immediately understand how and what you need to draw. Detailing the picture. To do this, add a spare wheel, a door handle, a fuel tank cap and various decorative lines. 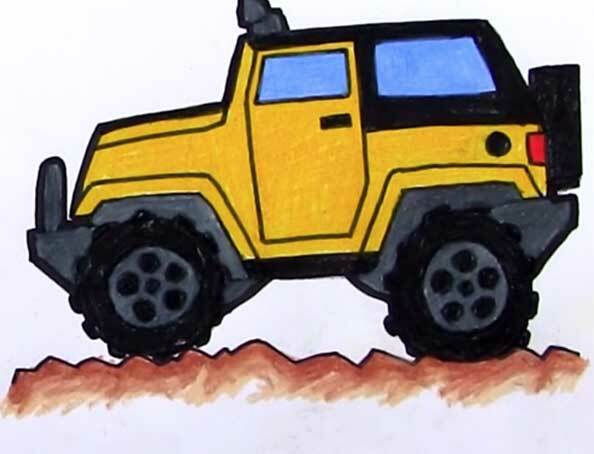 Now finally take the coloured pencils and paint our jeep in bright colours! 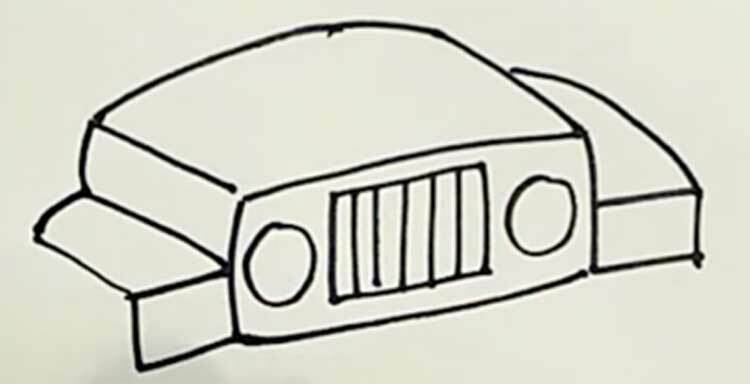 Let’s start with a problematic example that will demonstrate how to draw a jeep car in a practical technique. The drawing will be done in a half-turn, it is because of this that difficulty in the drawing is created. 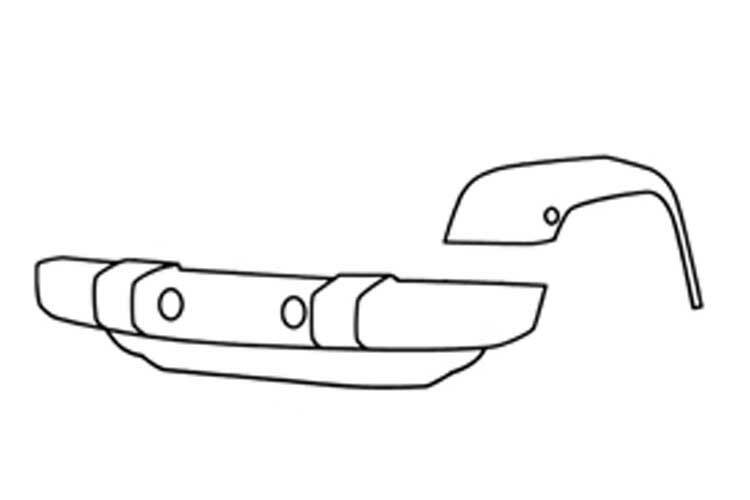 In the first stage, we have to portray the front bumper and one of the wheel arches. It is highly recommended to use the most ordinary pencils and an eraser, and then you will be able to erase the mistakes and redraw. 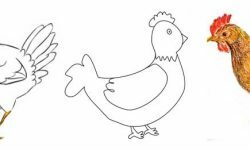 You can take a pen and circle a picture as soon as you are sure that everything is drawn correctly. We depict the grille, which consists of several vertical holes. Then we draw the hood and combine all the details. Now let’s work on the side of our jeep. 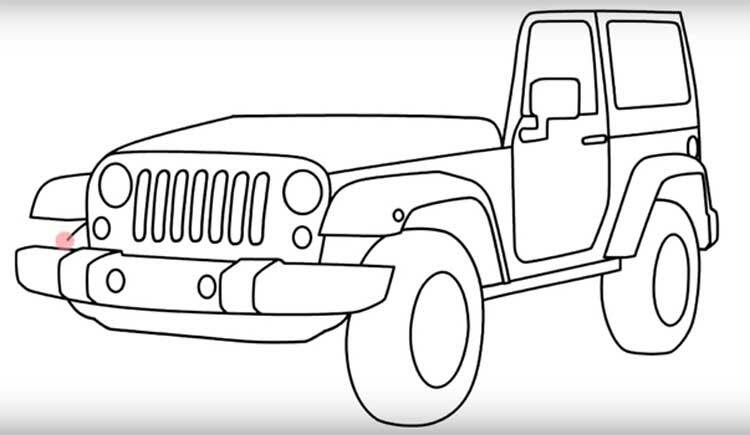 Draw wheels, doors, mirrors and more. Please note that some lines are perfectly even. 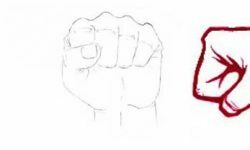 If you can not draw a straight line from the hand, then you can use a regular ruler. We draw a windshield, and also we connect all the significant details into small ones. At the last stage, we will paint some black elements like a grille and wheel arches in solid black. 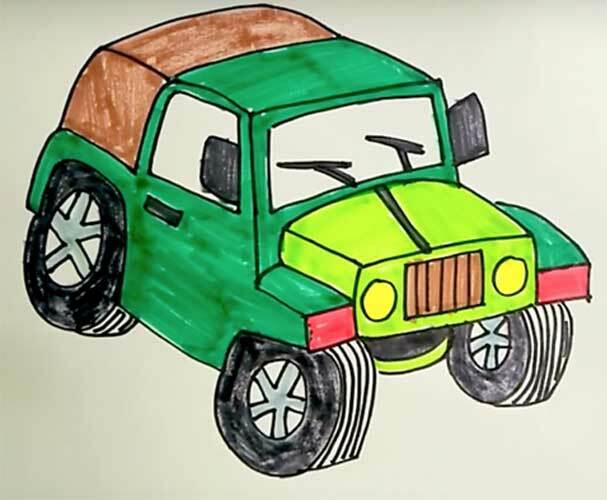 If you wish, you can use coloured pencils and colour the resulting jeep. 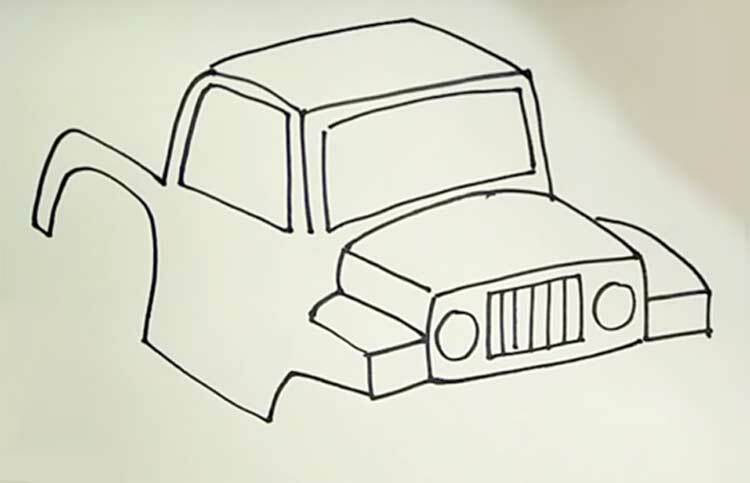 This drawing method is similar to the previous one, it will show how to draw a jeep with a pencil, but this time some of the details will be greatly simplified, so the whole drawing of this example is more straightforward. 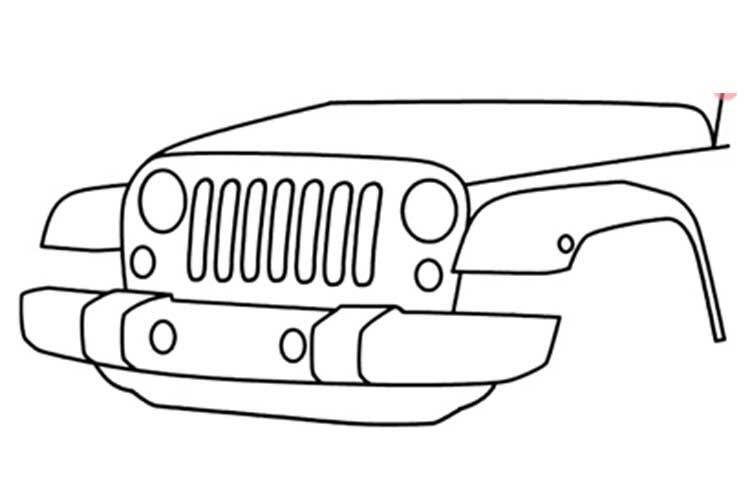 Let’s start with the front of the jeep and draw a hood, round headlights and square fenders. Work on the entire body of the car. As you may have noticed, the collection consists, of course, sharp and sharp parts. We draw small details such as wipers, bands on the hood and mirrors. Without them, the drawing will be incomplete, so be sure to portray them. Also, we are working on the wheels, pay attention to the fact that they should be volumetric. 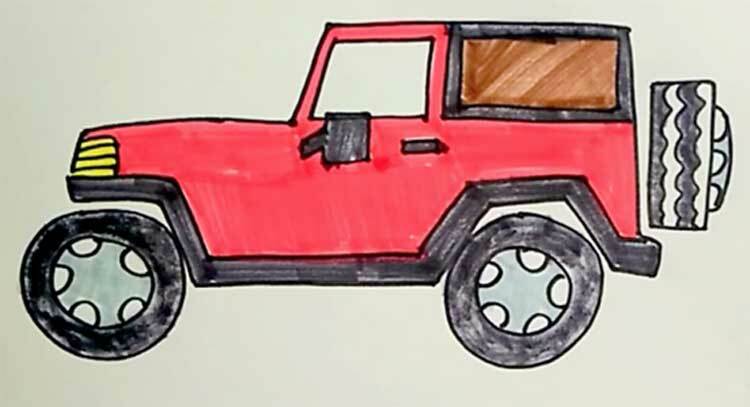 Take the coloured markers and paint our jeep. We decided to choose green tones, but if you don’t have them or you don’t like them, you can choose any other colours.